If the Fluid sign represents ease, the ability to pay spontaneous attention to one’s own interior and that of others, creating a free flowing movement which underlies the relationship movement, the Jerky sign, on the other hand, is that which, through various kinds of small graphical stopping movements, is most conducive to the separative movement. To understand the psychological complexity of this sign we must start from the purpose it responds to, which is that of maintaining a precise distance between the Self and the external world, through actions that are more or less perceptible by others, such as frequent interruptions, contractions, stiffening, contortions and abrupt reversals of movement, because it fears invasion or even mere fusion. In this way a dual result is obtained: the sharing movement, understood as both self-expression and acceptance of others’ point of view is hindered; and the individual does not suffer from loneliness, since it is the separative movement that appears instinctive, and therefore takes on the status of ‘spontaneous’, while it is the relationship movement that appears awkward. We should bear in mind that the interpretation of the Fluid/Jerky duality allows us to grasp the personality’s orientation about a disposition containing significant implications associated with gender. 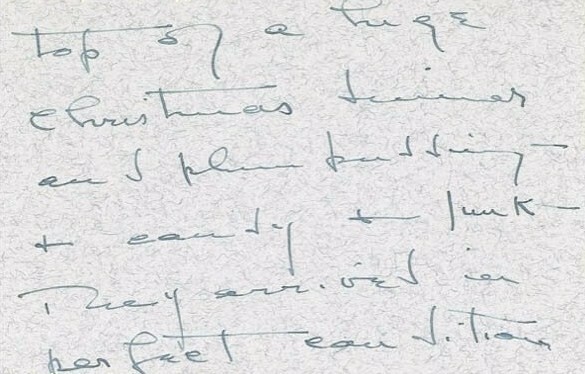 As the studies on gender differences show ever more commonly, the relationship movement – which in graphology is based on the Fluid sign – is the manner of adapting to the world preferred by women; while the need to concentrate on oneself, in a movement of individuation and definition, which entails the need to create a barrier between the Self and others, is that preferred by men. Based on these initial considerations we can easily understand why, from the first years of school, girls’ handwriting expresses the Fluid sign more, and boys’ handwriting tolerates a higher degree of the Jerky sign. Fig. 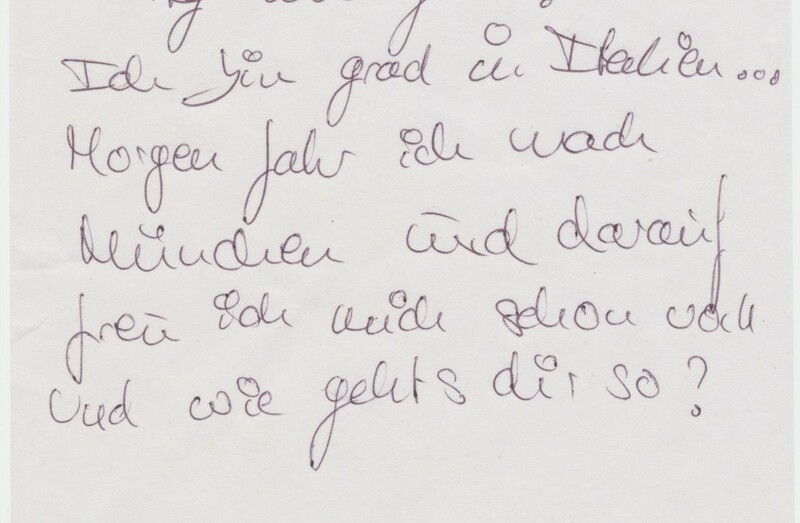 7 – Female fluid handwriting (aged 14). It is always the studies on gender that lead us to interpret the presence of the Jerky sign as an indicator of greater suffering if it appears in feminine handwriting. For the same reason, masculine jerkiness cannot be considered an indicator of mental suffering, unless it is particularly intense. While it is an excess of fluidity that creates a sensation of unease in males, because it is experienced as a possible source of depersonalisation, and it is this that generates the compensating need to create relationships with closed people, or rather those able to give the Self that stop that it can’t give itself. The precise quantification of the Jerky sign, as in the case of the Fluid sign, is excluded from the application of specific rules, since it is linked to the interaction of the phenomena described above. The scale from 1 to 10, in this case, indicates the strength of the separation movement of the Self by means of barely visible movements when we are dealing with small diffused angularities or small hitches, but which can become very highly visible if the intensity and frequency of the phenomenon increase. If the jerkiness is slight, though widespread, the sign stays below 5/10, while if it is intense then we need to carefully evaluate its frequency to determine how far above average the sign is. From the psychological point of view the sign has very different implications, depending on the intensity with which it occurs. While maintaining a constant meaning of separative movement based on the stumble, on the need to be wary of the movement of others creating prejudicial difficulties, so that the Self is not invaded by the outside, the further implications change significantly. A slight, imperceptible graphical jerkiness appears on the psychic level through behaviour such as evasion, subtraction and non-explanation, because the individual is always seeking her uniqueness, and therefore does not feel disposed to implementing a relationship movement, seen as a possible source of confusion, contamination or surrender. However, when jerkiness increases it indicates a more intense need for separation, which becomes almost violent and is viewed as being caused by the outside: it is others who, through their absurd invasive demands, have to be stopped. The tendency towards stumbling, which is by nature interior, is projected outwards, in a progressive movement of accumulation of resentment against the misconduct of others, which makes the individual more and more angry. Generally slight indicators of jerkiness have positive implications when they correct the extroversion of the Fluid sign. 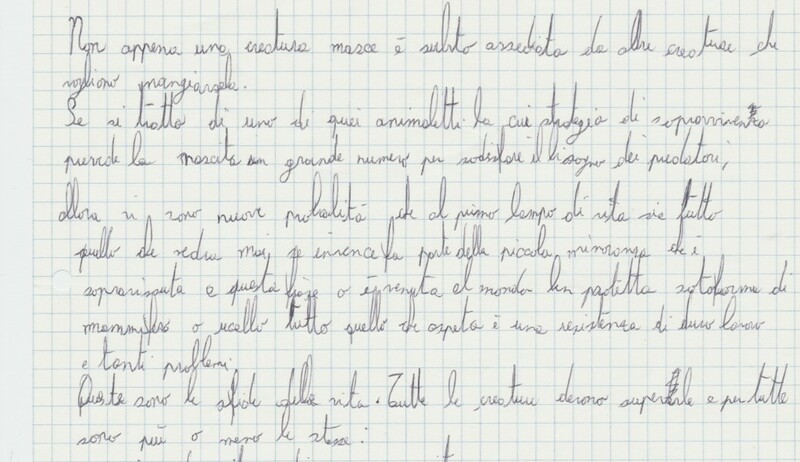 Often in his works Moretti notes that, starting from intellectual potential, for example that given by the presence of the Methodically Uneven sign and the above average triple width, the personality with some signs of hesitation has greater explanatory force, because this makes it capable of greater objectivity, greater tenacity, lower tendency towards conciliation, at least until all the contradictions have been adequately taken into consideration and resolved. From the aptitude perspective, the personality draws strength from some degree of graphical jerkiness in all those fields in which the ability to carefully observe the material world, as occurs for example in scientific research, for the following reasons: when the Fluid sign is above average it finds it hard to dwell on obstacles, so that the synthesis it implements can be based on an excessive simplification of the phenomenon observed or the cancellation of uncomfortable data. Jerkiness is not limited to avoiding glossing over any differences, but rather it searches for them, thus increasing the process of differentiating reality. Moreover, it also allows the personality to withstand the isolation necessary for the creative process and support the interior psychological pressure of accumulating contradictions without forcing premature synthesis. However, when handwriting displays a strong graphical jerkiness, it is clear that the personality has built an enormous defensive barrier between itself and the world. This defensive barrier, as Moretti emphasises, consists of an habitual state of sullenness, subjective in nature, so sentiment “may resemble the external nature of the hedgehog, so that no one can draw near.” (26) Jerkiness, therefore, starts from sentiment and then extends to the mind, through rationalisations of various kinds that lead directly to a spirit of contradiction maintained “in the introduction, formation of the syllogism and the conclusion.” (27) In this way the personality also protects itself from any form of empathy. The logic underlying this defensive strategy is the following: if I listen to the needs of others, if I put myself in their shoes, if I tune in to their feelings, I will end up feeling a sense of pity and this will lead me to surrender, in other words to sacrifice something that’s mine for another. Therefore stumbling constitutes the essence of the rupture of the sharing movement, in the method and in the purpose, which is that of isolating sentiment. The consequences of this abrupt stop, continually repeated over time, are many. Since Jerky is directly opposite to Fluid, where the latter never gets violently angry because it has the ability to express its point of view without accumulating resentments or recriminations, the Jerky sign, however, not having the gift of free expression, accumulates for two reasons. The first is that the tendency to stumble leads it to dwell on a lot of details which it cannot easily turn away from, because it does not see them as a single phenomenon. The direct disposition towards fragmentation belongs to sentiment, and this means that (at social level) there is a difficulty understanding the sense of others’ actions, which are viewed with suspicion owing to the fear that the Self has of being invaded, robbed or at least ridiculed. In addition to an increase in the capacity to see obstacles and/or malicious people around oneself, jerkiness creates interior accumulation also because the personality does not ever manage to fully express its point of view so that it is possible to finally let it go. Therefore every little event in life is retained, repressed and compressed, and the anger that follows comes from this constant feeling of injury to its own rights, inability to adequately explain itself with anyone, whether partners, children, friends, work colleagues, etc. Above average jerkiness is always a sign of psychic suffering because, in fact, it is an extreme isolation implemented by the personality as a defence to excess: it is the Self against everything and everyone, always in a rage because the world is literally crucifying it. It can no longer interpreted as a correction of the Fluid sign and only becomes the signal that something in the individual’s personal history has provoked extreme precautionary defences, which in a given period have to have had their own reason for existing. The psychological interpretation is deduced from the whole graphical context, considering how intense the hitch is and how frequently it occurs. Since this is a substantial sign of sentiment, if it has an above average value there are also important repercussions with regard to learning, since “it stops intellection both in conception and in reasoning” (31). Lastly, it should be noted that graphical jerkiness appears as an key indicator in the process of graphical aging, especially in the initial phase, when jerkiness due to age occurs mainly as rigidity and not trembling. We should keep in mind that the two frameworks are not always clearly discernible in their different origins. For this reason the indication of the writer’s age is crucial when evaluating graphical jerkiness in its evolutionary psychological implications, for example as a possible sign of a difficult infancy or youth, or involutionary psychological implications, i.e. following the loss of motor agility. The Jerky sign due to age preserves the psychological meaning of loss of spontaneity and immediacy of the movement, whether it is physical or psychic, which results in a loss of confidence in the world, seen as disturbing, dangerous and hostile, characteristics of many elderly people, because the personality has lost the ability to tune into the problems the world expresses. But as a rule, as we can see in Fig. 120, the involutionary process occurs in a graphical context which also denotes loss of definition of the forms (therefore less material memory), simplification of the line (and one’s needs), hesitation in proceeding (because one doubts one’s own perception and understanding), graphical indicators that take from jerkiness that significance linked to psychic compression, which is the first cause of anger in a personality in full physical vigour.